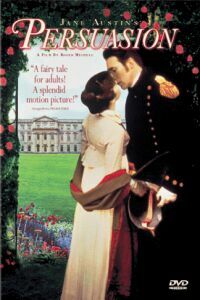 If you liked A ROOM WITH A VIEW, you will enjoy this film adaptation of Jane Austin's, novel PERSUASION. Here, Anne Elliot looses and regains the love of a poor, but honorable naval officer. Beautifully acted and wonderfully told, PERSUASION demonstrates moral rectitude in its treatment of family, Christianity and marriage. If you liked A ROOM WITH A VIEW, you will enjoy PERSUASION, a film adaptation of Jane Austin’s novel. Anne Elliot throws away an opportunity to marry at the age of 19 on poor advice. Years later, her family is living in debt. They move to Bath and lease their home to Admiral Croft and his wife, the sister of Frederick Wentworth, Anne’s lost love. Anne and her sister Mary stay behind to welcome their new tenants. To her surprise, Frederick makes an appearance. A group of family, friends and officers decides to take a small holiday to the sea side. There, Sir William Elliot pledges his love to Anne. To sort out this new advance, Anne goes to Bath to see her family where she abandons hopes of marriage to William or Frederick. Frederick, however, reveals his undying love for Anne in a letter. Thrilled, she goes to him, and they plan to marry, upsetting family and society expectations. Beautifully acted and wonderfully told, the characters hold a certain realism and warmth that could easily have been stereotyped or overplayed. The dry, but serviceable, photography and art direction seems to suite Anne’s forlornness perfectly. Dramatically, the film sustains suspense throughout. PERSUASION demonstrates moral rectitude in its treatment of family, Christianity and marriage, uncommon in modern 20th Century cinema. (B, C, L, V, A, D, M) Moral worldview extoling love, marriage & Christian faith; two obscenities; woman has a near-fatal fall; alcohol use; smoking; and, gossiping.